When you debark from your jetliner and head for your vacation spot at Santa Catalina's Rancho Estero, you are in for the surprise of your life. You may have heard that Isla Coiba and Isla Santa Catalina have some of the best surfing in Central America, and you may have assumed that it is party time all day and all night at Santa Catalina, but you will be surprised as the peaceful white beaches offer you time to rest and recharge, away from all of the noise of daily life. Santa Catalina's Rancho Estero is surrounded by beautiful scenery and white beaches where you can lose yourself in reading and relaxation or, if you are so inclined, you can don scuba gear and swim among the area's diverse sea life as the warm currents encourage huge schools of tropical fish, humpback whales and orcas. 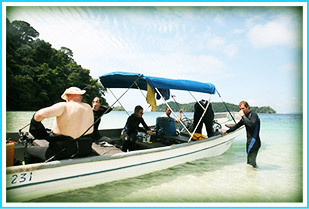 The coral reef of the Coiba National Park is rich and diverse as it hosts sea turtles and schools of tropical fish. This is the type of diversity that you only see in TV specials or on 3D movies. However, at Rancho Estero the friendly staff of hosts and hostesses will meet your needs. 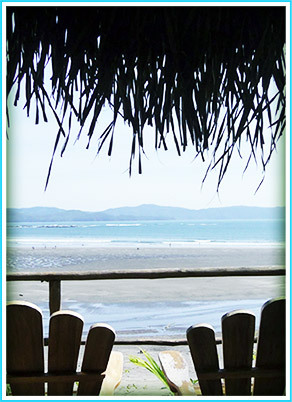 Surfers should plan their visits to Rancho Estero from August to February when the surf is up at Isla Coiba. When you have finished your trip, whether you are surfing or are just resting, we know you will have had the time of your life.